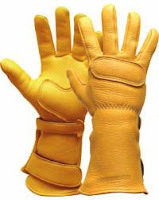 Lee Parks Design "DeerSports" gauntlet-style deerskin gloves in in Gold, sizes Small and under and XXL and up, for only $55! That's half price. I own 3 pair of Lee Parks' gloves, including the black 'n' tan version of DeerSports, and I love 'em! Simple design with very few seams for comfort and safety (fewer seams = less thread to potentially fail in a crash). Soft, great control feel, washable and repairable. If you've got really big or really small mitts: these are awesome gloves at a great price. Here is the link to the closeout sale.